Heaven to Felipe is carrot cake with an ice cold Ginger Beer. 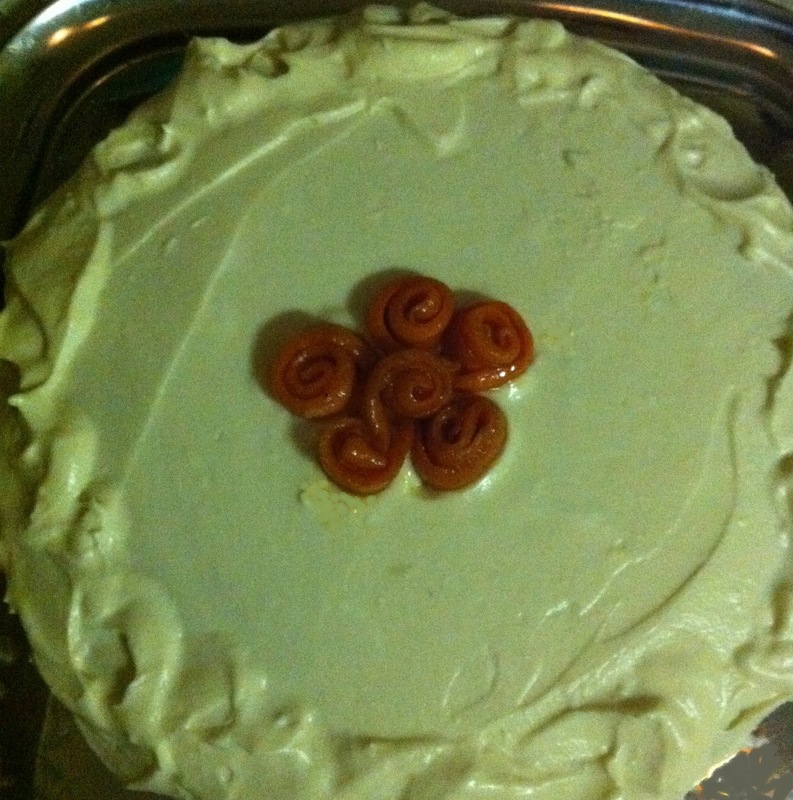 An acceptable carrot cake was one of those things he was in search of after we started eating a vegan diet. He found a few that he could tolerate but nothing that he went back for seconds on and nothing that was worthy of wasting his Bundaberg on until he ate this cake. 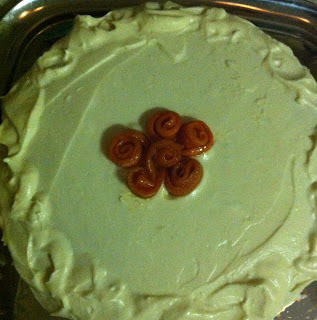 This was the first vegan cake recipe that I mastered after reading a couple handfuls of recipes. Felipe doesn’t like nuts but I am sure you could add them if you like. 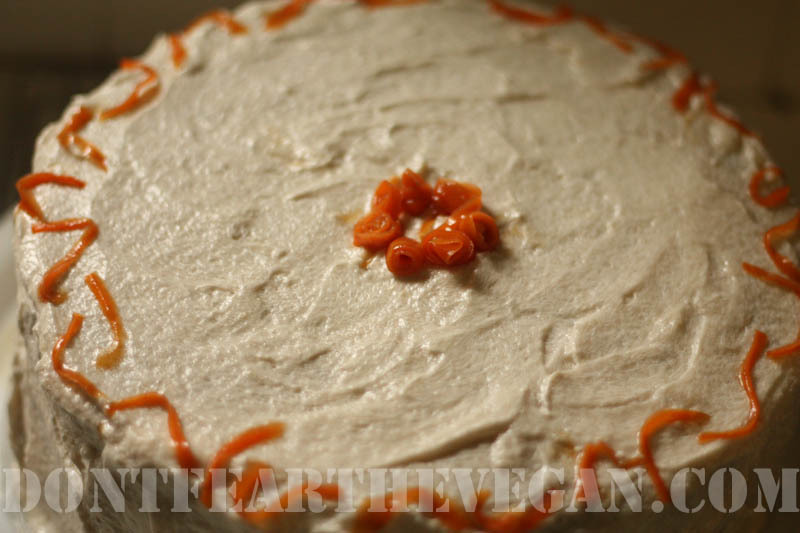 I have had quite a few people tell me vegan and not that this is one of the best carrot cakes they have had. If you can let the cake sit overnight it ages well. I hope you enjoy! 3/4 lb carrots (approximately 3 cups) made into mush. If you shred them or buy pre-shredded the cake will not be as moist. In a bowl mix together all dry ingredients. I use a whisk to get out all lumps. In a separate bowl mix wet ingredients together. Make a whole in center of dry ingredients and slowly pour wet ingredients in. Stir until well mix. Distribute batter evenly between three cake pans. Bake for approximately 20 minutes (do not pull out until cake has pulled away from the sides of the pans. Remove from oven let sit for a few minutes and then flip onto cooling racks (I usually wait until I can touch pans with my bare hands.) Let cool completely. Minimum 1 hour. Make icing with a mixer. You will get smoother icing if you blend cream cheese, Earth Balance and syrup together first and then slowly add in powder sugar. Put enough on first & second layers so that you can’t see cake through it but don’t get carried away. Use remaining ice on the rest of the cake. For caramelized carrots melt sugar over low heat with pineapple juice. Once sugar is dissolved add Earth Balance and Pumpkin Pie Spice. When Earth Balance is melted add carrot. Raise temp to med/low until it reaches a slight boil and then reduce heat back to low. 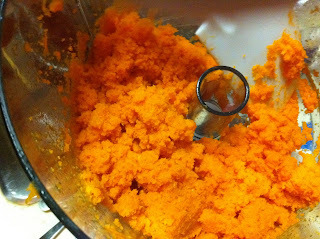 Cook until carrot is tender. Set them on a paper towel and let cool until they can be easily handled. Roll as you wish and decorate cake.